Ornithologists of Primorsky Region and naturalist photographers keen on birds are at a loss. Its cause was a small and very secretive bird. She was considered long since extinct, but Reed Parrotbill returned to the reed beds of the De Vries peninsula. Head and beak - almost like a parrot, tiny wings and an elongated tail size even larger than herself. Reed canopy is the name of a bird when translated from scientific. Reed because lives exclusively in them. In Primorye, it was first discovered on the shores of Lake Khanka. Alexander Alexandrovich 60 years in ornithology. 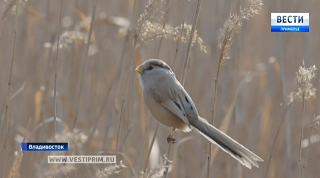 He is worried that a bird that has returned from oblivion in Primorye is facing extinction. But the population of seaside reed sutors worth their weight in gold is most likely only a few hundred, and the closest one is similar only in Mongolia, and that one is another subspecies. In southern China, it is still there, but there and in Primorye ornithologists beat the bells. The disappearance of the reed sutor can be final. And only man is to blame for this. In Primorye this bird was already disappearing - after the flood of the Khanka and the gradual disappearance of reeds on its banks. Scientists and naturalist photographers are urging villagers to stop letting the burns through reed groves. Otherwise, the last coastal flock of the Red Book bird will remain only on the pages of scientific almanacs.